A decarboxylative hydroamination cascade reaction of 3-arylpropiolic acids with N-heterocycles under transition-metal-free conditions was developed. 3-Arylpropiolic acids were found to react smoothly with a range of N-heterocycles under the effect of t-BuOK to afford N-vinyl heterocycles in moderate to excellent yields. This reaction represents the first decarboxylative hydroamination of 3-arylpropiolic acids without the aid of a transition-metal catalyst. 5b Hamada Y, Shinomoto S, Yamada I, Koike H. EP 162359, 1985 , Chem. Abstr. 1986, 104, 168465v. 5d Gist-Brocades NV. NL 8005204, 1982 , Chem. Abstr. 1982, 100, 492276. 6 Extra-pure t-BuOK (sublimed grade, 99.99% trace metals basis) was purchased from Sigma–Aldrich. 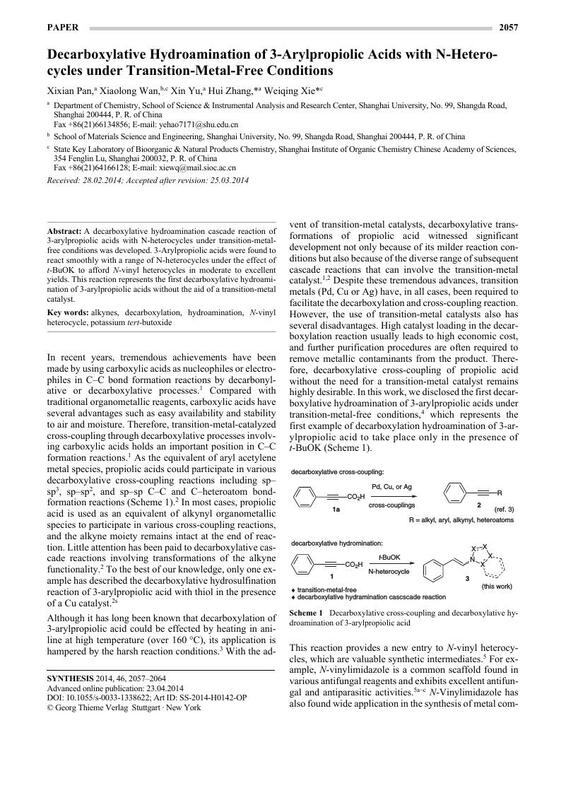 7 Phenylacetylene was found to be labile in the presence of t-BuOK because no phenylacetylene was detected by GC under the same reaction conditions after 24 h.
8 No product was isolated when t-BuOK (2.2 equiv) was used, probably due to the instability of phenylacetylene in the presence of excess t-BuOK.